Ever wondered what image sizes work best on Squidoo? In the following cases, there’s a maximum width (but not height); Squidoo shrinks the graphic to fit but keeps the height proportional if you give it something larger. Best to let Photoshop or an image resizer to do it; Squidoo’s built in shrinker isn’t as smart. The width of the Squidoo column (e.g. Text with BIG Picture module) is 590 pixels wide. The lens logo graphic and the graphics that can be uploaded to the Text module are a maximum of 250 pixels wide; Squidoo shrinks them to fit. Lensmaster photo on your profile page: 120 pixels wide. The Polaroid Module is 400 pixels wide. In the following cases, Squidoo needs the graphic to be absolutely square. It does this by scaling the graphic to the specified width, then cropping or adding whitespace to the top and bottom to make a perfect square. Instead of using keywords for the lens logo graphic, Squidoo replaces the filename with a long string of numbers. If you replace the graphic, it keeps the same string of numbers, so external tools like SquidTool’s Featured Lenses tool will still work. Want to see how your lens graphic looks at different sizes (e.g. the featured lenses module, related lens sidebar, etc)? 1. Go to your lens and right-click the lens graphic to get its url. Want to see how it looks at different sizes? Then change the -1 (in the URL of the published version) or the 250 (in the URL from the workshop) to the desired width. That shows you the graphic scaled to different sizes. But remember, for the Squidoo front page, the “Related lenses” sidebar graphic, and the Featured Lenses module, the graphic will be cropped square. Squidoo has done something with CSS classes to make it crop exactly in the middle, and you know what? I still can’t replicate what they’re doing to make the square crop. So just know that it’s the exact middle of the graphic. Need to figure out the image size of a graphic you’ve found somewhere else? See How to Tell an Image’s Size, both pixel dimensions and file size/memory. gif: no animation allowed, and no transparency (it makes a black background). gifs have a maximum of 256 colors; if you save a photo as a gif it gets a bit posterized. gifs use very little memory and are fast-loading. jpg: this is usually the best format for Squidoo. It uses less memory by compressing the photo somewhat (cheating to save space). If you look closely, you may find jpgs have lost some detail, like YouTube videos but not quite as bad because the data isn’t compressed (simplified to save memory) quite as much. png: this format is a memory hog, but preserves the colors and pixels accurately. Larger-sized pngs may not upload on Squidoo (I think the max may be 1MB, not sure). The only problem is that, as with transparent gifs, where one color is designated to be transparent and let the background page color show through, Squidoo fills in the “transparent color” with black. The way to avoid this is to uncheck transparency when saving a png, or save it as a jpg and put up with the slight loss of resolution. 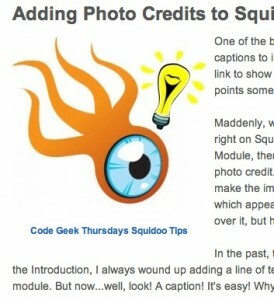 Handy Squidoo Tip: Caption a Lens Logo or Text Module Graphic! Eureka! Why didn’t I figure this out sooner? There is a fairly simple CSS way to force a caption (including an image caption with clickable link) to hang out directly under a Squidoo lens logo or an image uploaded into the text module! Ta-da! Actual screencap of a lens! Of course, the easiest thing would be if Squidoo would add an optional caption slot for images. But then, I suppose there’s no way to guess what height / style the caption slot ought to be. It depends whether you’re trying to make a photo credit or some kind of comment/description. I’ve used ICDSoft as my web host for 8 years now, long before Web 2.0 burst onto the scene. I’ve hosted various personal websites on it and used it as file storage space for online communities where I was an admin or member. On Squidoo, I continue to find it extremely useful for image hosting. First, it’s fast, and I’m not dependent on Squidoo’s servers. Second, I have ICDsoft’s own traffic stats data, which records longterm trends like keyword searches that brought people to those images. I’ve got eight years of keyword data to mull through when pondering what people search for — I really need to spend more time digging through the records to help me brainstorm for lens topic ideas! Third, ICDSoft lets me block hotlinking. Most importantly, having images hosted off-Squidoo lets me store the images for each lens in folders whose names reinforce SEO. For example, all my images for my volcano lens are stored in a folder named [blah blah]/volcanoes/[filename].jpg. This means every single image reinforces the relevance of that lens for the keyword “volcanoes.” You could use this technique on image hosting sites like Picasa and Photobucket as well, provided they let you name image folders, and those names are incorporated into the image URL. On a side note… Where can you find information on which of your lens graphics is generating search traffic? Check Stats for that lens. Scroll down to “Referrers” below the pie chart. Under “Referrers,” click Google. For some reason Squidoo treats Google image search as a referrer, not a search engine. Look for referrals beginning with these words: /imgresimgurl. Shortly after that will be the URL of the image. That means someone did a Google Image search, saw your graphic in the results of the image search, clicked on that graphic and came to your lens. That means that someone found my lens by doing an image search for mount pinatubo. I’m really not sure how, since other images turn up ahead of mine in Google image search, but they did, so there you are. Normally you’ll never need to dig that deeply into your stats, but just in case, that’s how. Don’t ask me what all that other gobbledygook is, though. Zazzle Referrals = Creative Commons that Earn Cash? Last week I had a brain wave. Zazzle designs work a little like e Creative Commons: as a Zazzle Associate, you may feature them on your page or blog by providing credit and a link (in this case, a referral link) back! You’re promoting an artist’s products (that’s the whole point). But as a side benefit, you have access to a huge body of gorgeous graphics. I was discouraged when I found a Squidoo lensmaster taking designs from my Squidoo Graphics lens and selling them on Zazzle, ignoring the Creative Commons license I posted on that lens. I didn’t feel like making new graphics, after that. However, I’ve recently been inspired again. Recently, a newbie asked if there were Squidoo banners one could download. I started to send him to the official Squidoo banners downloads lens, but I saw that none of those graphics are really banners. So I made some and posted a new Squidoo Banners For You lens. So what? Is this just a transparent link-drop? No, actually, I want to teach you a little about graphics, so you understand what I’m doing, and more importantly, so you understand what you are doing when you resize, save, or use a graphic. Disclaimer: The Squidoo logo is a trademark of Squidoo LLC. This blog is not endorsed by/affiliated with Squidoo LLC. I think that to date, the Squidoo Museum is my best lens as far as presentation, although the Fancy Table of Contents lens comes close. I’d like to talk about how I put together the Squidoo Museum. It demonstrates everything I know about graphics, color, fonts, and CSS. I’ve been thinking. Try as I might, I’m a journeyman when it comes to Squidoo SEO: I have the basic techniques down, I know what I’m doing, but I’ve got the online equivalent of an undergraduate college degree rather than a PhD. Whereas I’ve been doing computer graphics and layout since 1980, HTML since 1993, and CSS since–well, whenever it first came out. So I should share more of my tips on graphics and webpage design. Here’s a few!